Popular design app Sketch is making a few changes, and it could ruffle some feathers. Instead of buying a flashy new ‘.0’ version when it comes out, you’ll now have to pay an annual licensing fee. Until now, it has been our custom to release a major version of Sketch (2.0, 3.0, etc) every couple of years as a paid upgrade, with minor updates (3.1, 3.2, etc) for free in between. While this is a very common model for software, we don’t think it is fair: customers who have purchased an app closer to the original release date get free updates for longer than someone who bought the same product halfway through its release cycle. We think a fairer approach is for everybody to get the same period of free updates, no matter when they purchased the app. If you own a Sketch 3 license, we can guarantee you will continue to receive free updates for at least the next six months — or until one year after you originally purchased Sketch — whichever comes last! After then, if you want to continue to upgrade to new releases, just renew your license and you’ll be set for the next year. If you don’t want to renew your license after your current one expires, that’s completely fine; you will be able to continue using that version of Sketch for as long as you want. The problem may be pricing. In attempting to clear up its original post, Sketch says we’ll have to pay $99 annually to continue to enjoy its latest versions (which doesn’t include bug fix updates, which Sketch will provide even if you’re overdue to re-up). Piling on, I’ll add that Sketch isn’t committing to an upgrade cycle. Instead, it claims that it will simply update the app as needed with the features that are ready. Critically, I think this is a misstep. I’d rather pay for bundled features as an in-app purchase (which is possible, since Sketch famously ditched the Mac App Store for its own distribution framework) than an annual fee — which I believe was a monetization strategy to begin with (and something Sketch is starting to make good on). It’s still cheaper than Adobe Creative Cloud (which charges $19.99 per month for a single-app; you know, like XD), but Sketch is edging its way toward shaky ground. Once you start asking customers to pay for features, it gets dicey. 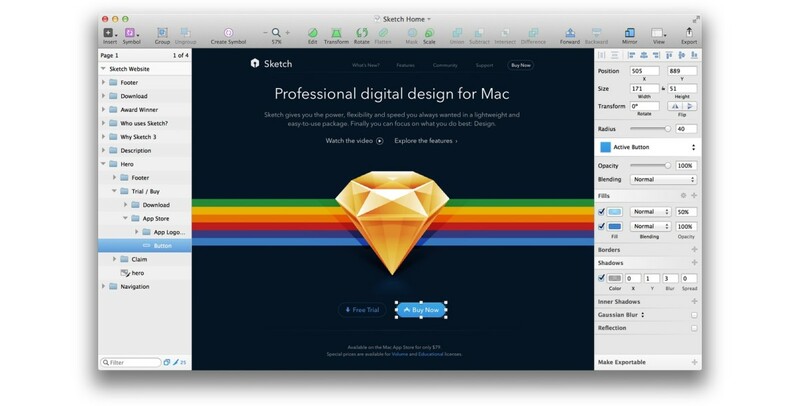 While older versions of Sketch will still work, the company cleverly says files created with newer versions of Sketch may not be backwards-compatible (“we will have to change the file format from time to time”). If you’re working collaboratively with another designer or developer, that could be a problem. And where will it end? If Sketch is monetizing so fervently, will InVision follow suit with Craft, it’s must-have suite of add-ons for designers? Many good extensions in Sketch’s official library are already paid ones, but only a few are ones I’d consider necessary to most users. The uneasiness can likely be quelled with a cleverly managed update cycle, but Sketch isn’t promising anything (probably in part because it doesn’t want users ‘gaming’ its system by upgrading when it’s advantageous to receive new upgrades). Now that it’s starting to monetize more actively, I expect designers to start being a lot more critical of Sketch and it’s practices — which also affects partners who create extensions. And at the point Creative Cloud starts making sense to the bottom line, Sketch may lose on of its biggest advantages, especially to cash-strapped independent designers and developers. Sketch thinks its new scheme is ‘fairer,’ and that’s their prerogative. Monetization is a corner all startups have to turn at one point or another, and Sketch is simply going a different direction than most. I’m just not sold that it’s the best path forward, especially since Sketch is obfuscating the future.